Use the form on the right to contact Rich. Rich Feller is Past-President National Career Development Association, a Distinguished Teaching Scholar of counseling and career development at Colorado State University, Speaker, Author and Thought Leader at lifereimagined.com. A personal guidance system for a lifetime of transitions created for AARP. 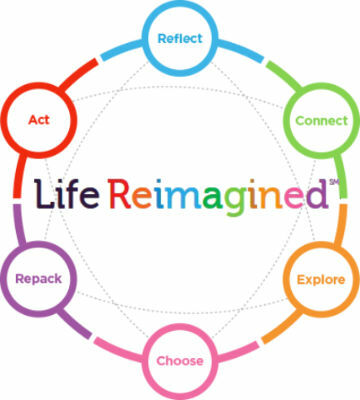 Life Reimagined presents 6 practice areas- Reflect, Connect, Explore,Choose, Repack, Act. Offering practical steps to identify and act upon your "What's Next? ", you'll find access to the LifeMap, Check-up, workshops, and short articles and activities, including: 10 Top Reasons to Work With a Coach. Rich worked as one of the original Life Reimagined Thought Leaders. A resource for students, educators, parents, and counselors who are seeking and promoting careers in STEM. Developed out of Rich's work at NASA Headquarters, this is a free resource for students, counselors, educators, and parents. STEMCareer offers direction and support for those exploring a career in science, technology, engineering, and mathematics. This online version of the Career Decision Making System, co-authored with Art O’Shea, is a comprehensive career planning system distributed by Pearson. One of many free programs within the Life Reimagined program. YouScience … this webinar explains the importance behind using aptitudes and offers a quick look inside the results of YouScience.